As inferred in the accessory’s name, the Duo allows you to charge two devices simultaneously. The device has a mini USB port and two standard sized USB ports optimized for connection to iPhones, iPads, and iPod touches. 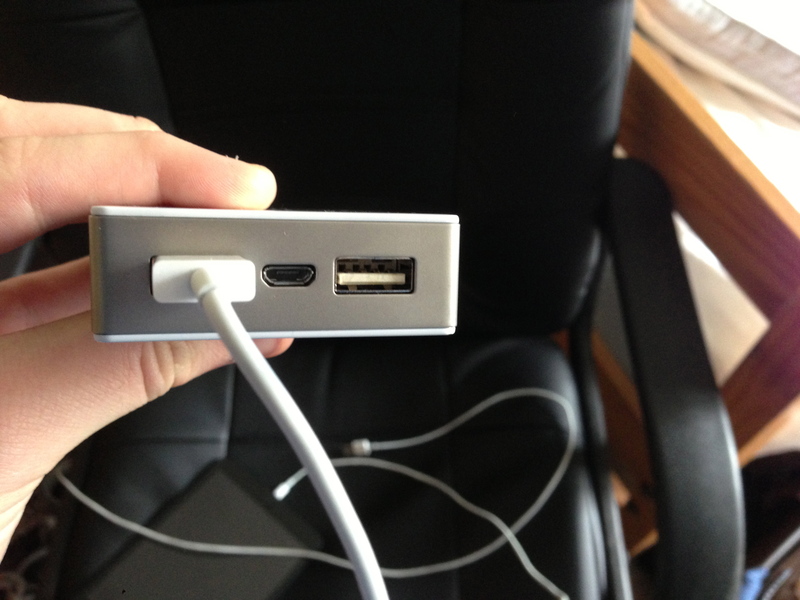 The mini USB port is for charging up the Duo itself. It is very easy to just keep my iPhone and iPad in my backpack connected to the Mophie Duo when I am running low on battery. The Mophie does a great job charging my iPad mini and my iPhone 5. 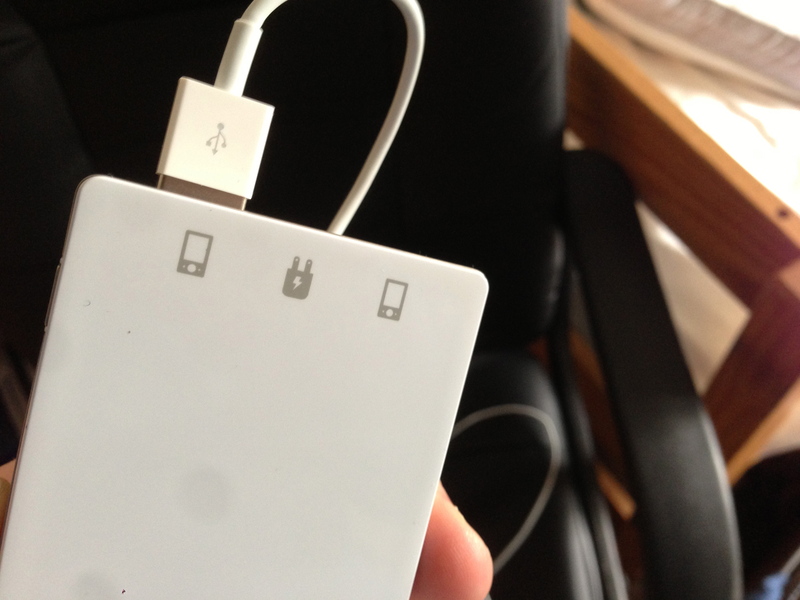 It is able to charge each of them up quickly. The Mophie Duo’s internal battery is large, sporting 6000 mAh of juice capacity. That is just enough to fully charge both an iPad mini and an iPhone 5 up completely. Currently, I find myself charging up the Mophie Duo each night alongside my iPhone and iPad mini in order to be fully stocked up for the next day. However, the Duo’s battery is so strong that it does not actually require charging each night. 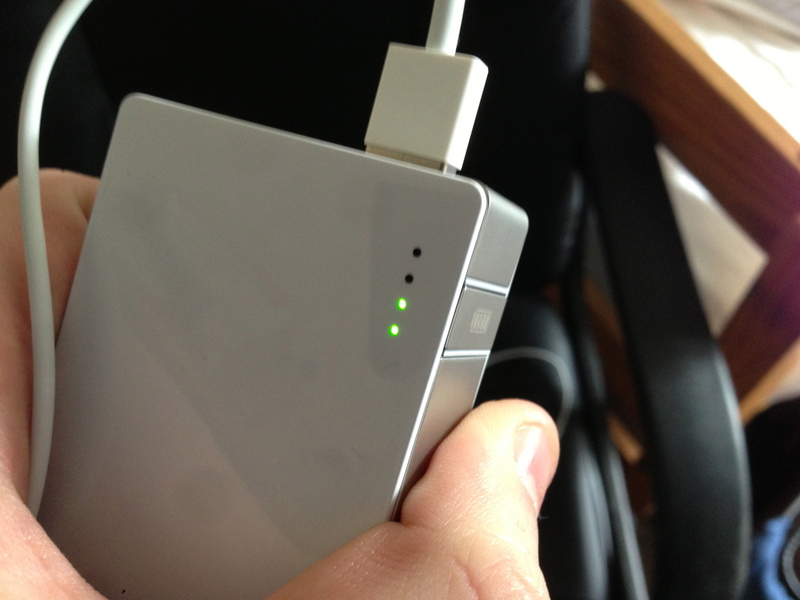 In fact, I have been using the Duo, without charging it up, for about a week. Each day for the past week I have been giving my iPhone 5 a conservative amount of juice (while away from my home charging outlet), and I still have about half of the Duo’s battery life leftover. Yes, the Duo is perfect for those who do not want to risk their iPhone and iPad mini (or both) from not making it through the day. For many smartphone and tablet users, these devices have become a focal point of communication, working, running businesses, entertainment, and more. Running low or out of battery life on these devices could be stressful for some, and I have found that this Duo is a great solution. Recently, I was traveling with friends across the country and one of our flights was delayed. 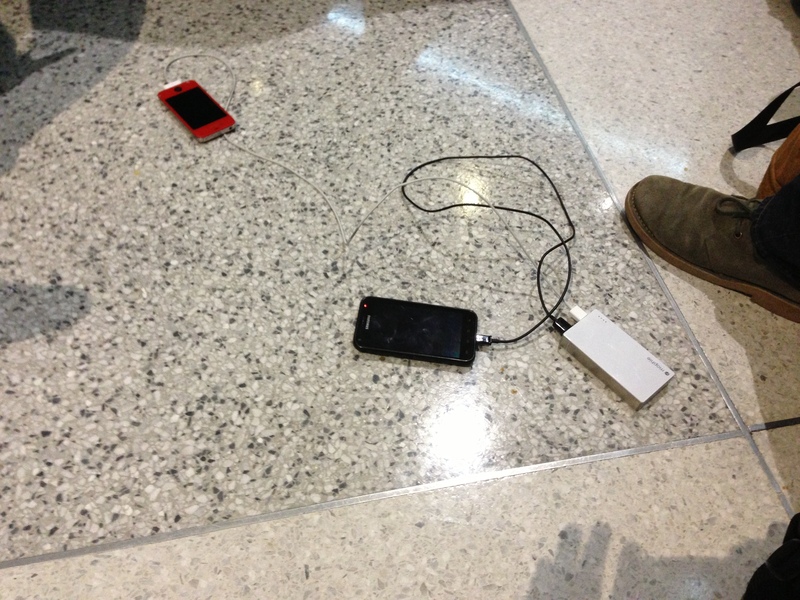 Here we were at an airport (late at night) with our phones running out of juice. I quickly pulled out my Mophie Duo, and the gadget (which is slightly larger than a deck of playing cards) was an instrumental help. Also, as you can see in the image, the Duo is fully compatible with other devices (such as Android phones). One device that the Mophie Duo is not perfect for is the third and fourth generation full-sized iPads. Those devices include very large internal battery packs in order to support and power the large, graphics-hungry Retina display. In my tests charging up a third-generation 9.7-inch iPad, I was able to fill up around 45% of the tablet’s battery on a full charge of the Duo. The third-generation iPad began with no battery life. So, the Duo will fill up your third-generation (and likely the fourth-generation iPad as it has the same battery component) to about half-way, which is nearly five hours of life. Not fantastic as the Duo’s performance is for an iPhone or iPad mini, but enough to probably extend your iPad’s usage for a full day. Because of its small size, the Duo is a must have external charger for me. I no longer have to measure my iOS device usage during the day in order to conserve battery life. When my battery is running low on my iPhone, I can even stick both devices in my pocket for charging. I can do the same (but typically in my bag) for my iPad mini. The Mophie Duo is a device of convenience and I highly recommend the product for anyone wanting to extend the battery life of two iOS devices throughout the day. The product also makes a nice solution for those waiting for an iPhone-compatible battery charging case. The bonus of sticking to this external charger (versus the case) is the ability connect another device simultaneously. The feel of the Duo is also high-quality. It is well-made with a hard plastic shell and metal sides. You will not have to worry about throwing this device around in your bag or keeping it in a pocket with keys or other items. The device also does not feature exterior flaps on any of the cable ports (like some similar products have), so you don’t have to worry about any pieces of the design breaking off. For those interested in the industrial design of the battery pack, I feel that the design was created to go specifically along with an iOS device. In fact, the materials and coloring makes it look sort of look like a thicker and heavier iPhone 4 or 4S. The Mophie Duo includes a USB cable for charging the accessory. The cable easily plugs into one of your existing iOS device wall chargers. When I charge both the Duo and my iPhone overnight, I plug the Duo directly into my iPhone’s wall charger, then plug the iPhone into the Duo. The Mophie Due comes in black and sells for $99. A white model (as pictured above) is also available for the same price, but it is an Apple Store exclusive. Mophie also sells stripped down, less expensive external battery packs. These accessories are thinner, only include one USB 2 port, and they hold less battery juice. A “Pro” Mophie external charger is also available (with one USB 2 port, but with the same battery capacity as the Duo). It includes a rugged outer shell for extra protection. These less-expensive models are ideal for those with only one iOS device or for those who only travel with a single iOS device.